This pocketsize book is an introductory exploration of basic artistic concepts and terms to assist with “travel” to the arts in physical, imaginary, or cyber ways. KEY TOPICS In so doing it treats uniformly the arts of architecture, painting, printmaking, photography, sculpture, music, theatre, dance, and film. It also provides users with a city by city/museum by museum guide to great works. For art appreciators everywhere—and for use wherever they are. During a discussion with some humanities faculty members, I was asked why I didn't write a short, inexpensive, pocket-sized book that students could carry with them on study abroad or for culturally related courses that involve traveling to metropolitan museums, concert halls, theatres, and so on. The idea was intriguing, and suggestions on what such a project might include gave ample opportunity for development. Further thought, however, led to the conclusion that there exists today more than one way to "travel" to the arts. There is the actual experience of physically traveling to museums and concert halls at home and in distant cities. There is also imaginary travel that can occur when reading a book about the arts. In addition, there is cyber travel in which access to distant works of art is immediate. This book attempts to assist in all three types of travel and to be equally useful as a pocket guide or instructional text. Those who suggested that this book be written were adamant about it not being copiously illustrated. They wanted something small in size, inexpensive, and general enough in nature that would have equal usefulness in Paris or Prague, London or Lisbon. Recognizing that this book can also serve as an introduction to humanities courses, I have included a few illustrations, including eight color plates. Additional historical information and illustrations can be found on the World Wide Web, and the URLs for doing so are indicated. Terms in bold also appear in the Glossary. The ultimate intent here is to broaden access to the world of the arts in a simple, inexpensive, and portable manner. I would like to express my appreciation for the helpful comments of the following reviewers: William G. Rich, Elon College; Craig L. Hanson, Muskingum College; Fabio Lopez-Lazaro, University of Calgary; Cyndia Susan Clegg, Pepperdine University; James E. Doan, Nova Southeastern University; David Sconyers, Franklin University; Herbert Luft, Pepperdine University; and Cortlandt Bellavance, Atlantic Cape Community College. A series of brief, high quality, and moderately priced handbooks written by well-known educators in their field of study. Each student-friendly handbook is designed to stand alone or to be packaged with a traditional survey text. 4. 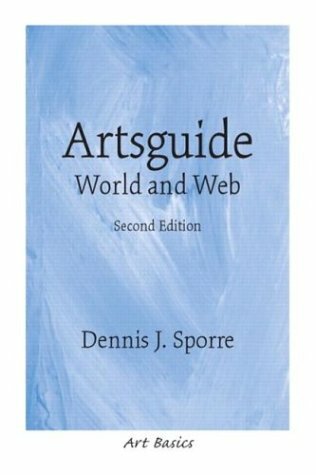 Artsguide: World and Web (2nd Edition) Sporre, Dennis J.